Baby Shower Wreaths can be fun and easy to make. Possibilities are endless wiith a little imagination. 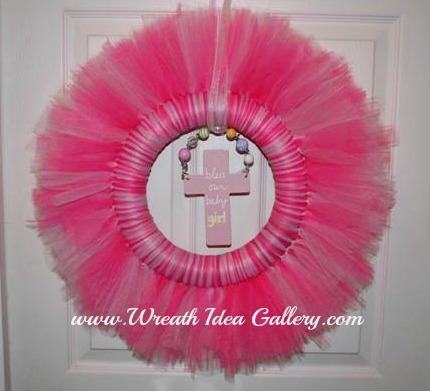 This wreath was made with a girl theme. I started with the Cross that I hung in the middle and then picked out a set of bibs that I thought fit the theme. Cross that said "Bless our Baby Girl" and the bib that said "Thank Heaven for Little Girls"
Diapers were attached with pink ribbon where I alternated tying on small plastic pins, blocks as I tied on the diapers. Add a bow and it is ready for the party or to be given as a gift. For step by step directions you can see just how I made this wreath. Do you have a special Wreath you would like to share? A baby shower wreaths can be made for any theme by just changing the the colors and or the items that you choose to attach. If you already know the baby's name you can make a wreath that has the baby's name on it. How beautiful for a girl pink teddy bears and flowers. Or for a boy blue teddy bears? The fabric Punch wreath is easy but takes some time to make. 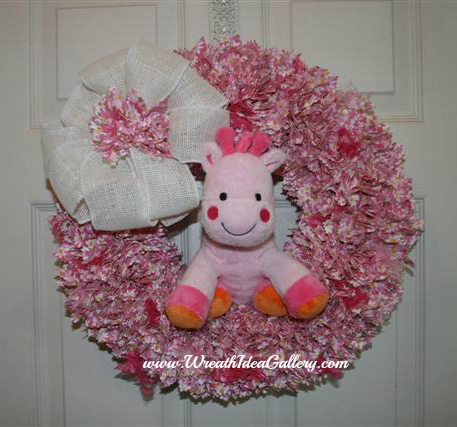 Made with pink fabric and lace accents this makes a perfect baby wreath for the nursery. A stuffed animal and a white burlap bow with a raggy flower center add the perfect final touches to this fabric wreath. Want to make your own wreath? Follow these instructions on how to make a fabric punch wreath. Beautiful wreath I made for a co-workers baby shower. I hope she will enjoy it for years to come. There is a lot of cutting and tying but really it is very easy, anyone can make this. Cross bought to hang in the middle to add that extra touch.